NEW! INGENIA'S TITAN Drive maximizes thruster output. i146-01 delivers up to 12 kW continuous power. Contact Us! Send us a note! Call for Quote or Information! Ingenia Motion Control and GROUP SIX ship first 9Kw Saturn Drives! Velocity estimation accuracy increased 25%. 146-01 delivers up to 12 kW continuous Marine & Subsea propulsion power. i146-SCE is, a modular, high-performance DC servo drive, developed to meet requirements of Marine & Subsea market. Call us for Quote or Information! 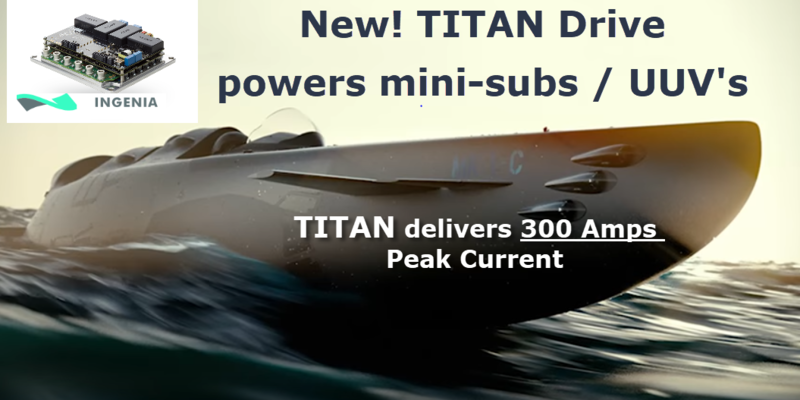 Ingenia Motion Control literally “launched” its new TITAN Series drives during the maiden voyages of manned mini-subs this month. Designed for rugged or hash environments, with a pressure tolerant option*, the TITAN runs at buss voltages from 10 to 300 VDC delivering up to 300 amps peak current and 200 amps continuous. The TITAN, measuring 172 mm x 206 mmx 30mm and weighing only 1.8 Kg, was designed for powering high current motors and thrusters from either battery or rectified power. Designed for compactness and a variety of feedback options, Ingenia’s TITAN is compatible with most commercial or MIL motor manufacturer’s offerings, including low inductance types. 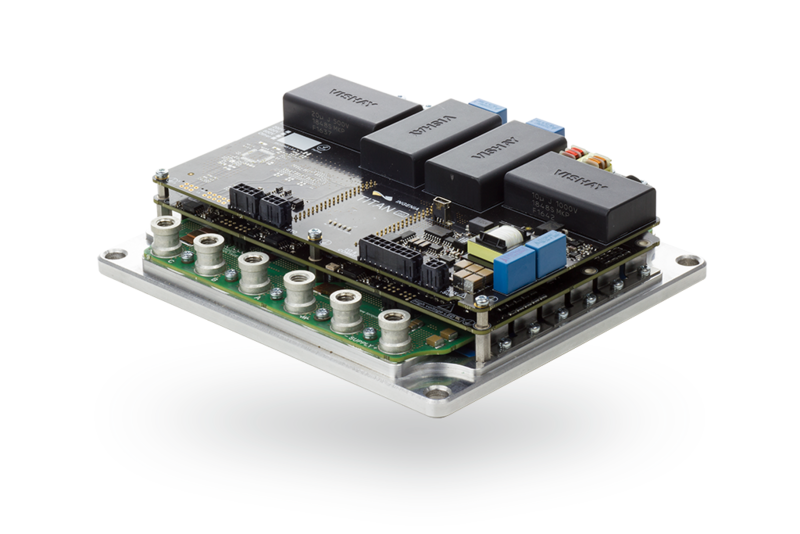 The TITAN Series Drive is configured as a stand-alone product or with pin-headers for UUV/ROV manufacturers to integrate the drive on to master control PCB’s. Users can specify a variety of options and the ability to scale the power either up or down is planned into the base design. Connections are robust lug type power and motor terminals and logic connections can be specified by the User. Command source interfaces include Network Interfaces like USB, CANOpen, EtherCAT, RS232, RS485 and feedback devices can be Digital Encoder, SinCos Encoder, Digital Hall, Analog Hall, Resolver, SSI, Sensorless, DC Tachometer, Analog Input or PWM Encoder to start. Design variants are suited to Industrial, Pressure Tolerant, High Temperature and Low Temperature. Ingenia's experience working with pressure tolerant electronics opens new doors to the world of manned and UUV submersible designs. Heat sinking through the hull of the vehicle to the water provides maximum ratings in pressurized or pressure tolerant chambers. Operation and control are either from a User CPU over network interface or by pre-programmed macros for integrating system components through analog or digital I/O. TITAN manuals and .STEP files are available. For more information on TITAN and other Ingenia drive products, please contact an Ingenia Motion Application Engineer. * Ingenia Motion Control designs and manufacturers pressure tolerant drives.